One of his current patients describes it best, “When you visit Dr. Noah you feel like you are the only patient he sees all day.” His genuine and caring demeanor comes through instantly, from that first welcoming smile all the way through every explanation he gives as he works through your procedure. 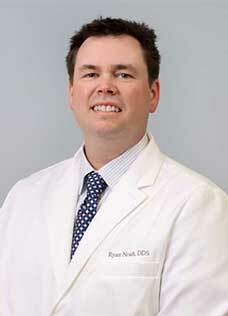 Dr. Noah comes from a little farming town called Westville, Oklahoma, from a family of farmers. His country roots naturally translate into his everyday work. You can rest assured that he’ll never try to pressure you into a treatment that you don’t want, but will gladly explain your options and let you make your own decisions. Dr. Noah completed his undergraduate degree from Northeastern State University in Tahlequah, Oklahoma and then graduated in 2008 from the University of Oklahoma College of Dentistry. He began practicing in Tulsa working for another dentist, fell in love with the area and the wonderful people here, and decided to stay when it was time to open his own practice.